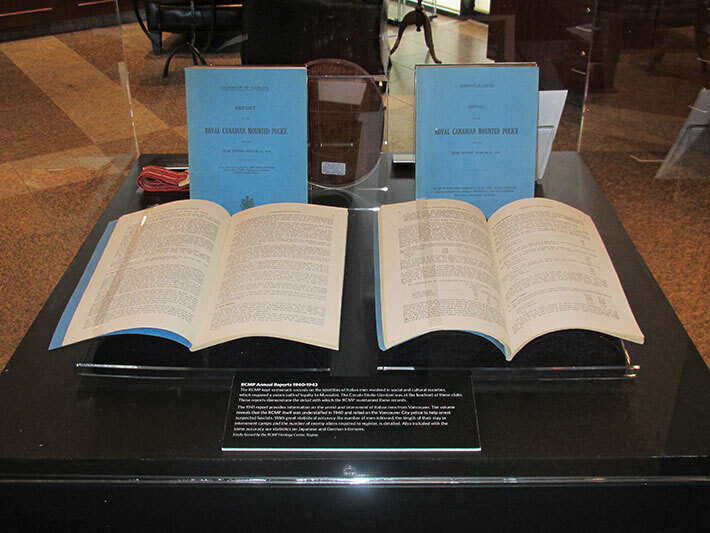 The display case contains copies of the RCMP Annual Reports from 1940-1943. Lists of Italian Canadians to be interned in the event of war had been compiled by the Royal Canadian Mounted Police (RCMP) well in advance of June 1940. The RCMP kept systematic records of the identities of Italian men involved in cultural and benevolent societies, such as the Order Sons of Italy (OSI). These reports demonstrate the detail with which the RCMP maintained these records. The 1941 report provides information on the arrest and internment of Italian men from Vancouver.